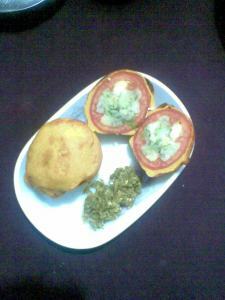 This recipe of tamatar bonda has a special story associated with it. When I was a research scholar at the department of botany at Banaras Hindu University, in the mid nineties there was a chaiwala at the 'botany crossing'. Usually he used to make samosas and chai , but whenever there was a rain he would always make this 'tamatar chop' as he would call it, and we friends (including now my husband Arvind) used to rush to the shop, as the bondas would disappear fast they were in such high demand. 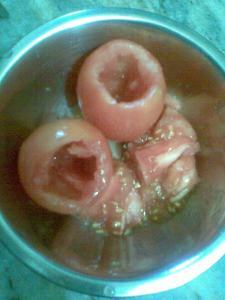 They used to be straight out of the kadhai very very hot and I remember the way we used to dig into the soft tomatoes, so hot to handle that often somebody would get a scalded tongue.. Eating those tamatar chops in the rain is still a nostalgia inducing memory and even now when it rains we both remember that and I have to get going. Food always brings sweet memories. 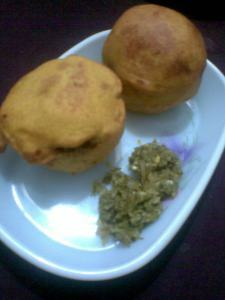 Heat oil in a deep pan to deep fry these bondas and till the oil gets hot, make a besan batter for dipping the bondas. 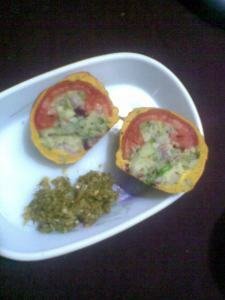 Now dip each stuffed tomato into the batter and dip into the pan to deep fry, turning it to let it fry evenly. Serve hot with a chutney of your choice. Normally I make a chutney with the scooped out tomato flesh with some coriander leaves but this time being quick served it with a preserved (pickled) green garlic chutney which tasted awesome with it. 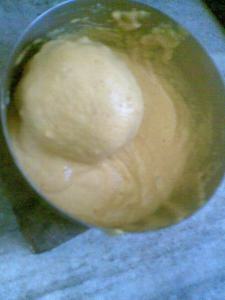 hey Puja...the batter has to be thick enough like the pic..
i was in the women's college from yr 88 to 91 the from 91 to 93 in department of botany doing my M.Sc. ...then from 95 to 99 i was doing my research in the dept. of botany...a long time span i have spend there...which dept. you were n in which year? 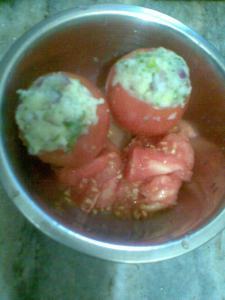 i saw this recepie on ur blog long ago, however i lost the url!, today when it was raining realy nice here in mumbai, i cudnt resist searching recepi n making tomato chop. but yes, the transverse n lateral section of bhonda whihc u have posted, shows ur a botanist! haha..
Keep posting something uniqe like this! and this sangeeta ji ?? why ji...am i too old suddenly? haah...even knowledge is not that much ...we are all learning you know. I left my research after a 4 n half years of work , that's how whimsical i am . But there were more reasons to that ...rest of it some other time. The pictures were lost due to a technical glitch sometime ago. I am restoring them one by one. Sorry for the inconvenience. Okie, didn't check the post properly yesterday and i was about ask you for the recipe then checked the FB page, saw your comment and came here!!! Totally yum!!! i m going to try it for the weekend! !